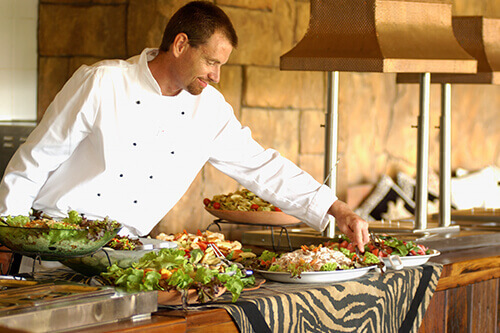 Three meals a day are included in the rate of your stay at Kaingo Game Reserve. We try our absolute best to ensure that each guest experiences morning coffee on a sunrise game drive, a bush breakfast, sundowner drinks on an evening game drive, and an authentic African boma dinner. Only fresh seasonal ingredients are used and prepared in the lodge kitchens every day. Kaingo takes pride in catering for all dietary requirements. Please chat to us about this. To give us the opportunity to design appropriate menus, we ask that you advise us of any specific dietary requirements prior to arrival. Have your breakfast under the trees while enjoying the antelope grazing nearby. We are renowned for our lovely breakfasts under the trees, where every detail is perfect, every mouthful is unforgettable and every moment is truly memorable. 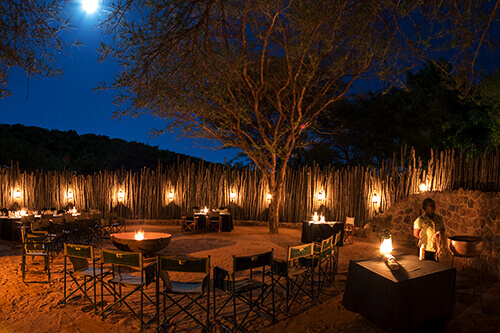 At Kaingo, we invite guests to dine the African way – in our traditional boma or in the middle of the bush. In the event of bad weather, meals are served in the Lodge’s dining spaces. 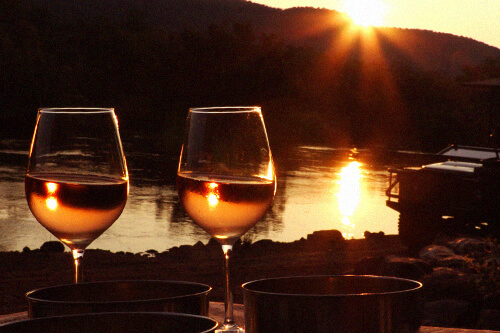 Fine dining in the wild is an experience you’ll never forget. 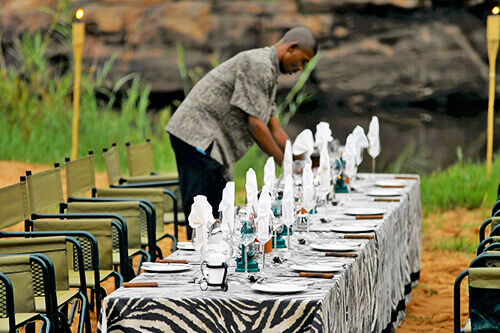 At your request, our chefs and staff can create a bush-based private dining room where you’ll eat beneath the sky, surrounded by the sights, sounds and sensations of glorious Africa. 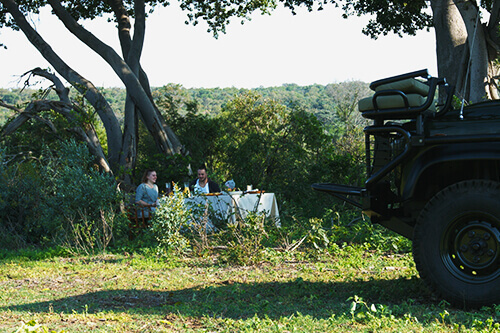 A safari is made more special with its game drive stops, whether it’s sunrise coffee and home-made biscuits or sunset wine, with crunchy crackers, biltong and tangy olives. To put it plainly, your familiar cuppa or refreshing cocktail will never taste the same again. How about sitting with your feet in the water surrounded by beautifully large shade trees? 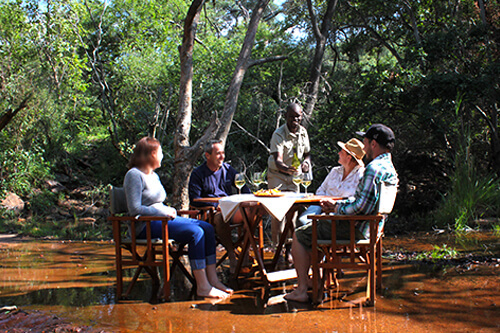 Or a river-side picnic as you watch the elephants splashing, or spotting some of our prolific birdlife? Sometimes, it’s the little things that create the greatest memories.